They are designed to provide a foundation for replacement teeth that look, feel, and function like natural teeth. The person who has lost teeth regains the ability to eat virtually anything, knowing that teeth appear natural and that facial contours will be preserved. Patients with dental implants can smile with confidence. The implants themselves are tiny titanium posts that are surgically placed into the jaw bone where teeth are missing. These metal anchors act as tooth root substitutes. The bone bonds with the titanium, creating a strong foundation for artificial teeth. preventing bone deterioration that occurs when teeth are missing. For most patients, the placement of dental implants involves two surgical procedures. First, implants are placed within your jaw bone. For the first three to six months following surgery, the implants are beneath the surface of the gums, gradually bonding with the jaw bone. You should be able to wear temporary dentures and eat a soft diet during this time. At the same time, your dentist is forming new replacement teeth. After the implant has bonded to the jaw bone, the second phase begins. Dr. Kim will uncover the implants and attach small posts that protrude through the gums and will act as anchors for the artificial teeth. When the artificial teeth are placed, these posts will not be seen. The entire procedure usually takes six to eight months. Most patients experience minimal disruption in their daily life. 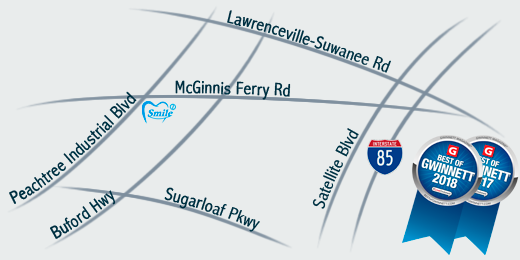 Dental Implant placement is a team effort between an oral and maxillofacial surgeon and a restorative dentist. While the oral surgeon performs the actual implant surgery, initial tooth extractions, and bone grafting when necessary, the restorative dentist (your dentist) fits and makes the permanent prosthesis. Your dentist will also make any temporary prosthesis needed during the implant process. 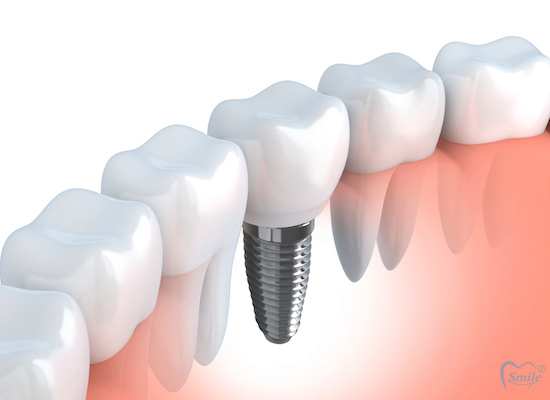 Using the most recent advances in dental implant technology, Dr. Kim are able to place single stage implants. These implants do not require a second procedure to uncover them. In addition, if there is still a non-savable tooth present (as opposed to a space where the tooth was removed a while back), often the implants can be placed at the same time as a tooth extraction further minimizing the number of surgical procedures. 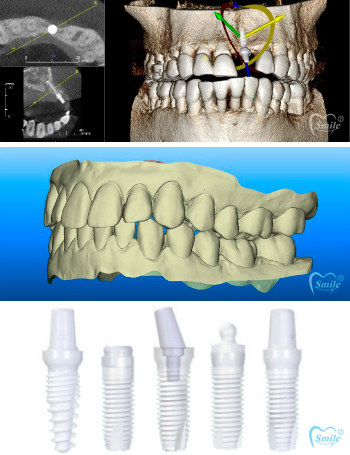 This 3-D Imaging technology makes dental Implant placement safer and more predictable than ever. The scanning technology allows Dr. Kim to simply scan the adjacent teeth and abutment/implant using a laser, thus eliminating the need for dental impression "mold" material (which is messy, tends to cause a gag reflex, and often must be repeated several times). The prosthetic/restorative doctor (your dentist) who works with Dr. Kim can now finalize the crowns on the dental implants without the need for an impression visit at her office, a visit that usually also involves several other parts and pieces going in and out of the mouth. That entire visit is eliminated thanks to this incredible technology. Dr. Kim is one of the few surgeons in U.S. that have the capability of placing Metal-Free Dental Implants. These tooth colored ceramic implants have some advantages in the aesthetic zone (front upper teeth) as well as in patients who prefer a metal-free option. Q: What Types Of Replacement Teeth Are Available? A: There are three types of replacement teeht available. A single prosthesis (crown) is used to replace one missing tooth each prosthetic tooth attaches to its own implant. Dr. Kim perform. in-office implant surgery in a hospital-style operating suite, thus optimizing the level of sterility. Inpatient hospital implant surgery is for patients who have special medical or anesthetic needs or for those who need extensive bone grafting from the jaw, hip or tibia. A: Once you learn about dental implants, you finally realize there is a way to improve your life. When you lose several teeth whether it’s a new situation or something you have lived with for years chances are you have never become fully accustomed to losing such a vital part of yourself. Q: Why Select Dental Implants Over More Traditional Types Of Restorations? A: There are several reasons: Why sacrifice the structure of surrounding good teeth to bridge a space? In addition, removing a denture or a partial at night may be inconvenient, not to mention that dentures that slip can be uncomfortable and rather embarrassing. Q: Are You A Candidate For Implants? A: If you are considering implants, your mouth must be examined thoroughly and your medical and dental history reviewed. If your mouth is not ideal for implants, ways of improving outcome, such as bone grafting, may be recommended. Call us today to schedule a consult! A: The majority of dental implant and bone graft oral surgeries can be performed in the office under local anesthesia, with or without general anesthesia. Q: Do Implants Need Special Care? © Smile 1 Dental Group. All Rights Reserved.